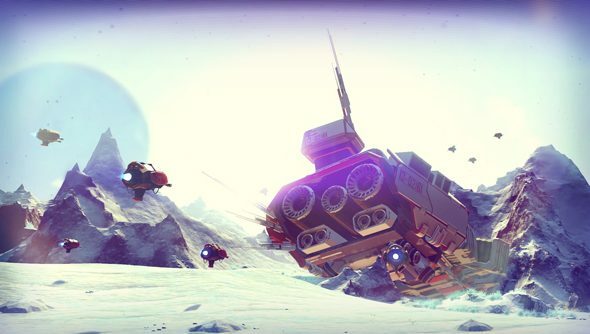 The Reddit user who acquired No Man’s Sky for $1,300 has almost reached the centre of the game’s galaxy after only 30 hours of play, and thinks it can be done faster. If you like ambling through the void then check out some more top space games on PC. User daymeeuhn has been answering questions in multiple Reddit threads about the game (due for release on August 9) which he bought from a leaked eBay listing this week for 20 times the retail price. One of the more interesting (and less spoilery) revelations he has is that despite not particularly trying to rush to the middle he’s made serious headway on the game’s enigmatic central journey. The trick daymeeuhn has found, which he describes as “questionable design choices”, allows players to exploit the way a valuable resource spawns in order to farm it quickly and travel large distances. He claims it is not an exploit in further clarification, but being able to gather such an important resource so quickly does rather pang of unintended behaviour. I’m really trying to avoid spoilers here, but you can read through the full explanation if that sort of thing doesn’t bother you. Daymeeuhn claims he’s not been attempting to rush through things, currently holding a full reputation among the game’s factions through normal play, but the farming has helped him get most of the way towards the de facto “end” of the game in just 30 hours. This seems to be at odds with suggestions of the game’s play length for that particular metric that Hello Games have hinted at being in the hundreds of hours. Of course, Sean Murray has also stressed that this isn’t a linear game with a simple through-line narrative and that exploration is more of a self-determined set of goals. Still, expect a deluge of “but what do you do?” comments even after the game is weeks old.